It was 1958 when the London-based Ludhiana Fellowship invited Beryl Howie, a young and newly qualified New Zealand obstetrician/gynaecologist, to join the staff of the Ludhiana Hospital in India. In this invitation, Beryl recognised God’s calling, and went to India. It was no easy challenge. In addition to undertaking a very busy clinical load, she also had to learn at least one of two local languages. Along the way, she was sustained by her faith in God, faith which motivated not only her medical work, but which also encouraged the study of the Bible among the students and patients that she had come to love. It came as a bit of a shock, therefore, when just before she was due for her first furlough the Ludhiana Fellowship told her that they had decided to move their support to training Indian doctors and asked her to find support elsewhere. 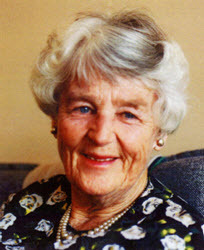 Bewildered but not undetermined, and after exploring several options, she soon accepted an invitation from the Presbyterian Church of New Zealand to become one of their missionaries and, in 1963, she set off under new colours but to essentially the same job. Over the next few years, while Beryl’s own workload stretched, so too did the old buildings in which she worked and which became increasingly inadequate for the burgeoning number of patients and new theatre equipment which arrived. She was soon dreaming about a new hospital for women and, during her next furlough, she challenged the New Zealand churches to raise $500,000 towards this. People all over New Zealand took enthusiastically to the project. When they had reached $100,000, the New Zealand Government offered to contribute $500,000 if the project raised that amount by Christmas. This challenge sparked off further enthusiasm among New Zealand churches. Several other missionaries were ‘at home on leave’ from India and others with a strong interest in Ludhiana helped to enthuse congregations and individuals to great heights. Suffice to say that Beryl returned to India with the plans and funding to begin planning for a new hospital and to start building. At the same time, she continued to work towards raising the standard of care of patients and developing higher educational and treatment standards of doctors, nurses and midwives. But there was another encouraging development. When Beryl first came to India, all newly-trained doctors with any available funding went to the UK and, if possible, the USA for postgraduate training. Most of them then looked for work there and didn’t return to India but rather supported their families from the high salaries they now earned. Beryl longed to change the natural path of graduates to keep them in India to serve their own compatriots. To that end, quality advanced training would have to be available. By 1980, 84% of all graduates in obstetrics and 29 of her MD graduates remained in practice in India. In 1981, Beryl finally left India and found work in two other missionary challenges – one was to write a text book on obstetrics and gynaecology specifically for students in India , and the other was to visit missionaries all over South East Asia and further encourage the development of improved healthcare. After finally retiring to New Zealand, she was honoured with an honorary doctorate in science by the University of Otago. My friend Bartha Hill has just authored a beautiful little book on Howie – Teaching Hundreds To Heal Millions: The Story of Dr Beryl Howie – and those in Dunedin are warmly welcome to attend its launch on Sunday 17 November, at 2 pm, at Highgate Presbyterian Church, Maori Hill, Dunedin.